I’ll start by drawing a random line on the page – “walked over to the Casino last night, just to check things out.” It was busy in there. Electric slot machines going off, idle snackers chewing idly, drinks cart with drinks on it, high-stakes table upstairs in the back, a separate and dazzling room for Baccarat. What is Baccarat? It was an epic night of gambling: I won 25 cents on my first play, then lost it all. $5 later and no closer to understanding how people can afford to gamble. I got a feeling, while sitting at the slots engulfed in the sound of crashing coins, that this would have been fun if I was ten; there is a glimmer of something inside that gets subtle joy in trying my hand at luck with a machine, but mostly the whole scene looks like noses following an invisible duck. If I had to pick a night job, it might be security in a place like that to keep an eye on the earnings, see what the tricks and secrets are to making it out flush from the mythical jackpot quest. There’s got to be something to it, after-all at 9pm on a Sunday it looked like school had just let out. It’s something like a phenomenon: enter to win $10,000! Subscribe for a chance to be entered to be considered for a lifetime giveaway of hard cash! We can never afford to miss a chance to win. Charlie Sheen knows – the feeling is awesome. As someone who spent a lot of time as a babysitter calling into radio shows only to end up with the busy signal every time, I have become somewhat jaded, and last night confirmed my suspicions. 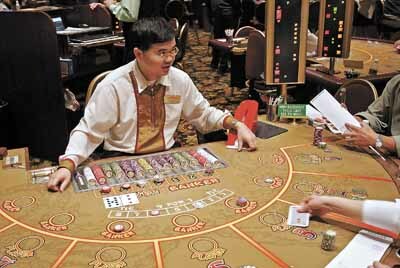 That being said, the cultural intersection that is a casino offers endless fascination. In the spirit of today’s post – Subscribe to 4mewla the blog at the bottom of this page and you can be entered to win your choice of a paperclip that you could turn into a house, or a series of lucky, randomly selected numbers. Have you been gambling with life? Professional: Gambling is his primary source of income; makes his living gambling. Casual Social Gambler: Gambling is one of many forms of entertainment; gamble infrequently. Serious Social Gambler: Gambles as a major source of entertainment; plays regularly at one or more types of gambling, and does so with great absorption and intensity. Relief-and-Escape Gambler: Major activity in person’s life of equal importance with family and business; but rest of life goes on without integrity being seriously impaired; more than a pastime. Compulsive Gambler: Gambling is only thing in life; ignores family and business, and often turns to crime to support his/her habit. Antisocial Personality: Life career is getting money by illegal means; those who gamble try to fix gambling games.